A senior Rashtriya Swayamsevak Sangh (RSS) leader on Monday asked the Narendra Modi government to fulfil its commitment to construct a Ram temple in Ayodhya and repeal Article 370 of the Constitution that grants special status to the state of Jammu and Kashmir. The Vishwa Hindu Parishad (VHP), at a meeting of its top decision-making body in Haridwar, termed it a "matter of pain" that grand temples of Ram, Krishna and Shiva had not been built at Ayodhya, Mathura and Varanasi, respectively, even 68 years after independence. The demands from RSS and VHP came on a day when Prime Minister Modi and Bharatiya Janata Party (BJP) launched a week-long programme to mark completion of one year of the National Democratic Alliance government at the Centre. The VHP passed a resolution at the meeting of its Kendriya Margdarshak Mandal, asking the government to "clear hurdles" for early construction of the Ram temple. International Working President Pravin Togadia and president Raghava Reddy were present at the meeting. "We have resolved that a delegation of saints would establish contact with the Centre and hold talks with it to clear hurdles in the way of Ram temple construction," a VHP statement said. The BJP favours a solution through a court verdict, or through talks between the rival parties locked in the legal tussle over the disputed site in Ayodhya. Earlier this month, Home Minister Rajnath Singh said on the sidelines of a VHP event in Ayodhya that the government's lack of majority in the Rajya Sabha makes it difficult to pass a law for the construction of the temple. At today's meeting, the VHP said no place of worship for Muslims would be allowed to come up in or near the proposed temple. It said it was thanks to independent India's first Home Minister Sardar Patel that Somnath Temple was rebuilt and it was time to carry on with that tradition. "Islamic invaders destroyed over 3,000 of our temples and other holy places. We have also sought three of them (Ayodhya, Mathura and Varanasi)... Our decency should not be seen as a weakness," it said. In Nagpur, RSS Akhil Bhartiya Saha Sampark Pramukh' Arun Kumar said the BJP government should fulfil promises on the Ram temple and repeal of Article 370. He claimed the people of Kashmir were suffering due to Article 370. Talking about the organisational set-up of RSS, he said that the organisation has 43,000 Rs shakhas' (branches) in India. 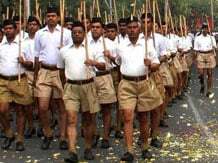 The Hindu Swayamsevak Sangh, the overseas arm of the RSS, operated in 35 countries.